For the AI counterpart, see Fleshpound (Killing Floor 2). The player-controlled Fleshpound is one of the playable ZEDs in Killing Floor 2's Versus Mode. It is a melee-only ZED that, along with the Scrake, might be considered as a highest threat due to its rage ability, high amount of the health, damage and unparryable AOE attacks. 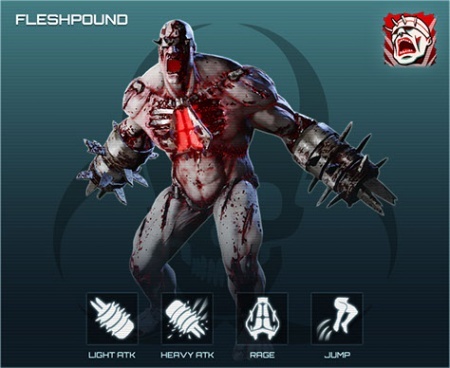 The player-controlled Fleshpound is not restricted to walking while docile and can enrage at will, as well as perform every attack that AI Fleshpounds are capable of, as well as some additional attacks which AI Fleshpounds do not possess.The Fleshpound's role in the ZED team is to lead the charge as the tank, soaking up damage. This will force the Survivor team to focus fire on you, allowing your teammates to attack or surround them while they are trying to take you down. Alternatively, player Fleshpounds can wait for their lesser brethren to occupy the Survivor team before charging in and dealing as much damage as possible. While the Fleshpound does not do as much damage as the Scrake, he has higher health and different resistances, allowing him to take a higher amount of punishment before going down. Due to Game Conductor mechanics, player-controlled Fleshpounds have their health modified based on the average level of the Survivor team. Values vary within (x0.85 - x2) range. Player-controlled Fleshpounds have a wide variety of damage type resistances and two notable weaknesses. Fleshpounds are weak to microwave and are resistant to other non-ballistic damage types. Fleshpounds resist to every type of ballistic weaponry, mostly to assault rifles and sub-machine guns. Fleshpounds have only one unique weakness which is the explosive damage of the RPG-7 projectile. It is worth mentioning that this is the only type of the explosive damage the player-controlled Fleshpounds are weak to. Fleshpounds have two weak spots, which is the head and chest plate. Their arm grinders mitigate half of the incoming damage. Vulnerability mask = (Torso, Head, Legs, Arms, Special). Primary / Secondary (while airborne): Smashes the ground with both arm grinders. Primary (while calm): 2-hit combo, a right hook followed by a left hook. Primary + Back (while calm): Smashes both gauntlets together in front, then kicks. Primary (sprinting while calm):Punches, followed quickly by a backhand. Secondary (while calm): Punchs forward with a powerful blow. Secondary + Back (while calm): Stands still and stabs forward with both arm grinders. Secondary (sprinting while calm): Leaps forward and smashes the ground with both arm grinders. Primary (while enraged): 2-hit combo, a right hook followed by a left hook (faster than calm version), or stabs both arm grinders forward then punches outward in a quick motion. Primary + Back (while enraged): Ducks then spins 3 times, dealing damage in a circle while traveling forward. Secondary (while enraged): Leaps forward and stabs with both arm grinders, or steps forward and punches with both arms simultaneously. Secondary + Back (while enraged): Performs an Uppercut - Ground Pound - Uppercut - Ground Pound combo while hopping forward, dealing a total of 4 hits. Bash: Enter Rage mode, stays enraged until a target is damaged. Passive: Like AI Fleshpounds, automatically enter Rage mode upon taking 276 points of damage. Note: Damage values below vary between (x0.7 - x1.31) based on average level of the human team. Heavy attack. Damage - 30. Maximum hit range - 2.5m. Vs doors - x5 more. Cooldown - 1.5s. Light attack. Damage - 30. Maximum hit range - 2.5m. Vs doors - x5 more. Cooldown - 0.75s. Block. Damage multiplier (firearms) - x0.7, Damage multiplier (melee) - x0.7. Cooldown - 0.2s. Note: When enraged Fleshpound can do bump damage to human players (damage - 2, radius - 2.4m, this type of the damage is radial, i.e. scales over proximity). Heavy attack (enraged): walking - x1.1 (5 hits per attack), running - x1.1, when moving backwards - x0.5, x0.5, x1. Heavy attack (sprinting) - x0.5 then x0.7. Heavy attack (walking / stationary) - x1 (5 hits per attack), when moving backwards - x0.5 (interval - 0.4s). Light attack (enraged): walking - x0.55 (6 hits per attack), running - x0.8 (7 hits per attack). Light attack (sprinting) - x0.34 (12 hits per attack). Light attack (walking / stationary) - x0.3 (19 hits per attack), when moving backwards - x1 (1 hit per attack). As a Fleshpound in PvP, it is not a good idea to attack recklessly as soon as you take control of the Fleshpound, be patient, wait then attack when they don't expect it, or attack in with other group of player-controlled ZEDs especially Sirens and Scrakes, if you have communication with your teammates you can tell the player who's controlling the Siren to trap a human with their Vortex attack for you or the player who's controlling the Scrake to attack them from behind and you're from the front, or just rushing the humans down when they're busy fighting the other lesser ZEDs. Player-controlled Fleshpounds start spawning at the last wave of the normal versus game. Most of the Fleshpound's attacks cannot be interrupted by parrying (damage mitigation still happening). Enraged Fleshpounds do damage to player just by standing nearby. Maximum human-controlled Fleshpounds allowed, per cycle AND / OR active at once - 2. This page was last edited on 6 February 2019, at 18:51.